I think one of the best things about raising our own chickens is being able to safely enjoy homemade recipes such as eggnog, tiramisu, Hollandaise sauce and mayonnaise which use uncooked or partially cooked eggs. The risk of salmonella in eggs from a backyard flock is far lower than in those from a commercial egg farm, so I have been indulging and making some of my favorite recipes again that call for raw or partially cooked eggs. 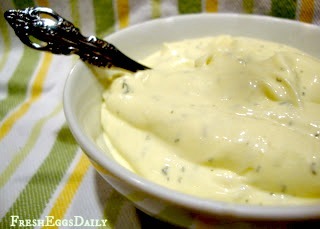 I recently made my first batch of homemade mayonnaise and decided to try it again, tweaking the recipe just a bit. Here's what I came up with (and I can tell you it is well worth the five minutes or so it takes to literally whip up a batch!). I love to add fresh herbs to my mayonnaise, or even some chopped fresh garlic, but it's completely optional. Dill works well, as does tarragon. Break the egg into a blender and add the salt. Blend on high 2-3 seconds until foamy. 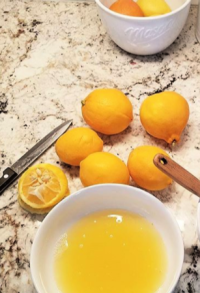 Add the vinegar and lemon juice and blend for 10 seconds. While on high speed, with the cover on and the little insert in the lid removed, slowly pour the combined oils into the blender in a slow, steady stream. The mixture should thicken to a beautiful consistency. Stir in the dill, if desired, or substitute in basil or any other favorite herb. Makes about 1-1/4 Cup of mayonnaise which will last in the refrigerator for about a week. Wonderful in egg salad, your favorite deviled egg recipe or on a BLT or egg sandwich. Click HERE for a few of my deviled egg recipes. I love your recipe. I agree that having chickens and the fresh eggs that they provide is wonderful with all the fresh foods like mayo! I just made some and it is YUM !!! Oh this sounds so good on a BLT!!! Oh you totally can do it! It's not hard at all. I'm linking to your party now! 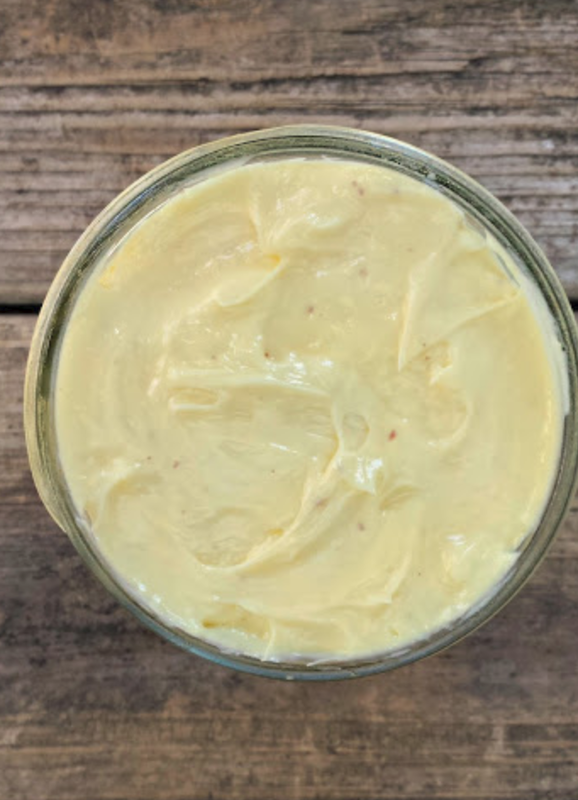 I LOVE making homemade mayo :) My favorite is garlic mayo :) Thank you so much for linking up with me this week at Tasty Tuesdays! I’ve pinned this & shared it with my followers! Canola... not so good for you. Treated to high heat and refining prior to our use. substitute grape seed or avocado oil. Or, just all olive oil. But thanks for sharing the proportions and recipe. Sure you can use whatever oil you wish, or a blend. It all works.